Saatchi Art’s curators have worked with artists from around the world to hand-pick every artwork we offer on Limited in order to provide you with an unmatched selection of limited edition prints. We are proud to offer "Dusk" by Rashna Hackett, which is available exclusively on Limited. Artworks in a limited edition have a set number of prints available for each size offered. For the 10x8 size edition, "Dusk" comes in a limited edition of only 40 prints. Once all 40 of the prints in this edition size have sold out, there will be no other prints of "Dusk" available in the size of 10 inches high by 8 inches wide. Limited edition prints of this artwork may be available in other sizes. This is an extra large painting that is bright and detailed. Brightens the wall. 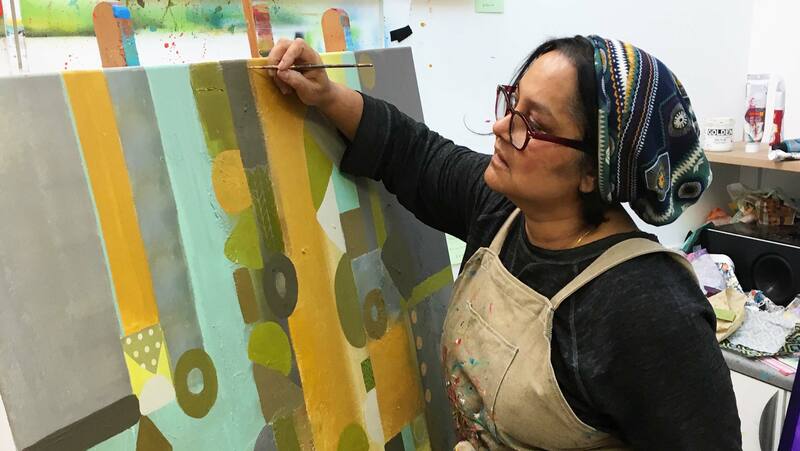 Rashna Hackett paints in a way that reflects her views of life: dynamic, complex, yet simple. Her geometric paintings are created without a plan. Her process is intuitive, as she reacts to the colors and layers of the work as they emerge, and names her works based on her moods.